1, the amount of wall thickness: to see whether the provisions of the wall thickness, here also note that some of the 8″ PVC Lay Flat Hose is empty, both ends of the wall to meet the requirements, but the middle wall thickness is thin, did not meet the requirements, cost. 2, the amount of length: to see whether the required length, and some manufacturers by shortening the length to reduce the price. In accordance with GB / T10002.1-2006 does not allow negative deviation. 1, see the gloss: the surface of a good look good oily nature is a high quality products. 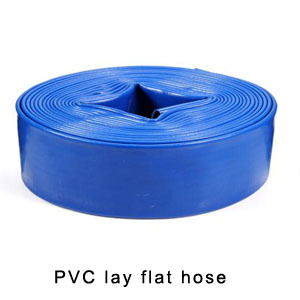 2, see the color: the standard high-quality PVC-U 8″ PVC Lay Flat Hose was light beige, if the pale that the 8″ PVC Lay Flat Hoseline that added excess calcium powder, some manufacturers miscellaneous materials, recycled material added too much, made of 8″ PVC Lay Flat Hose black, yellow. Weight: take the same caliber, wall thickness, length of the two 8″ PVC Lay Flat Hose weight, high weight of the calcium powder, impurity added too much material impure, fail to meet the requirements.